The reputation of your website in Google is an extremely important facet. After all, you do want to get a better rank than your rival websites in the search engine results pages. Now, Google considers quality to be the all important factor while determining the rankings. That is why you need to ensure that the content of your website is of a high quality. It will be indispensible for achieving success online. However, you may be wondering what kind of content is of a high quality. 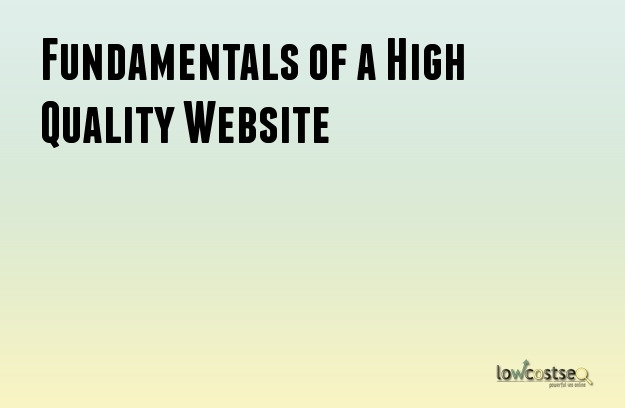 More importantly, you will be wondering how to ensure that the content of your website is of a high quality. There are certain elements you can consider for this purpose. What Is A High Quality Content? High quality content will be original. It will have a purpose and the information presented will be correct. The content will also be optimized properly. This will ensure that people will be driven to read or view the content and then share it with others. Search engine algorithms will recognize high quality content which means that you will get a better rank. High quality content delights the readers and fetches you a better rank. Any high quality content will have certain elements. Analyzing and then implementing these elements will help you make a content that is impressive and readable. Google is beginning to place more importance to analyzing the topics as well as the context of the content. They are not simply taking keywords into consideration. An easy tip would be to develop the content for the users and not for the search engines. Longer content is beginning to gain more importance. Ideally, a blog post should have more than 2000 words from the current SEO perspective. However, a reader will be satisfied with content if it is around 1500 words. The fact is that websites with longer content have the higher rankings. Readers will be interested in blogs and content that have supporting images or videos. These posts are more engaging. Moreover, images can help you get a better rank. Poor grammar and mistakes in spelling makes it difficult to read the content. Your readers will find you unprofessional. Moreover, search engines do penalize websites with these problems. After all, why would they rank a website with poor grammar when there are other websites with error free content? Your content should pose no problems while reading. The text needs to be read and understood easily. A tip would be to limit the length of the sentences and the paragraphs. People enjoy reading content that have been written by an expert in the field. This builds trust. The content should delve into the topic completely and explain it suitably. Research the topic thoroughly while writing the content. The time required for indexation of content can be cut by half if it has received extensive shares in social networks. The effect of implementing these elements may not be visible immediately but over time your website will grow into a powerful entity.